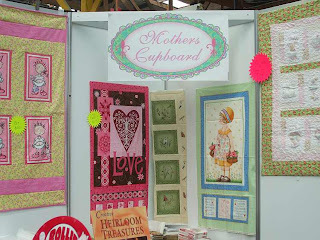 Fee's Little Craft Studio: The Show Starts Tomorrow !!! The Royal Hobart Show starts tomorrow. Today was set up day. Hubby, Sammy & I spent the morning creating the "Mothers Cupboard" site. We have a lovely Moda Pre-Cut Display. Wish me luck at my first "real" show. Wish I was going to be in Hobart this week, hope you have a great time Fiona. Hola, Fiona! Le deseo toda la suerte del mundo! Su stand quedó muy bien decorado y bien puesto! Hay muchas cosas allí que ofrecer! Sobre todo le deseo que sea una muy grata experiencia! Ya nos contará! Un abrazo! Muchos BESOTES!!! Hi Fiona, I wish you all the best at your first real show. Sure wish I was there, I really could use a day of this. Good luck to you!!! Your set up is beautiful. I'm excited for you and I know you will do well. Hiiiii, It´s very nice, good luck to you. Wishing you the best of luck at your very first show. Hope it all goes well. oooooo, I'd sooo love to be there....looks so good!!! I don't think you'll need luck today...looks wonderful! 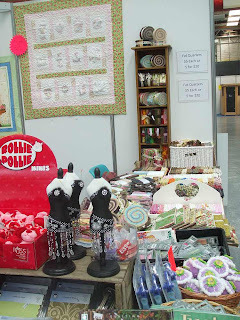 Wow the stall looks fabulous, can't wait to see it on Thursday! I hope today goes well! PS I hope you're feeling better too. Good luck with the show. Your display looks really inviting. good - hope it goes well for you over the weekend! 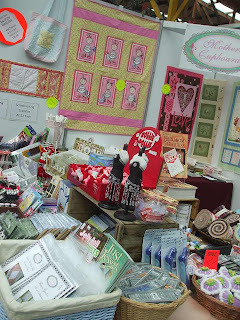 Best of luck, the stall looks wonderful, a crafters delight! Hope you do really well. I would love to take a deep breath and dive right into your booth! I wish you much success, Fiona! WOW!!!!!!! \o/\o/ You go girl!!! Looks very inviting - wish I could be there! Good Luck - Enjoy and sell lots of stuff! 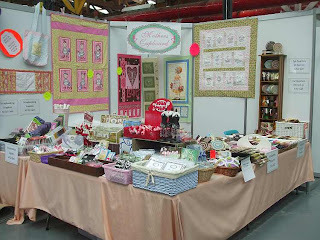 The stall looks great. Best of luck, and wish I could be there. Good luck Fiona, hope its a good one for you! stand looks great!! Best of luck with your first show ,the stand looks interesting and I am sure will attract a lot of attention. Congratulations Fiona....it looks yummy...I want to be there and browse already...sadly too far away! Everything looks wonderful..i wish that I could be there Fiona! It all looks lovely good luck on your first show I am sure you will do well I have my fingers crossed for you Fiona.